Dorm Co. Tip: College Posters make great cheap additions to dorm room decor! Your college wall decor is as important as the rest of your dorm essentials. Your dorm wall art isn't just for covering up some of those dorm room walls. Although your wall decorations for dorms are pretty useful for that - your college dorm room walls are going to be incredibly plain and bland. They may even actually detract from your dorm room decor a little bit. While adding to your dorm room decor, college posters will also make your college dorm room more comfortable. 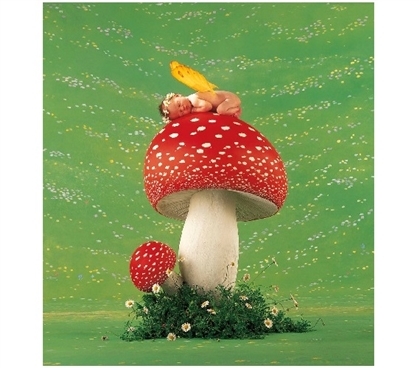 Our Anne Geddes - Toadstool - College Dorm Poster has a unique, simple design that will add some fun style to your dorm essentials! Our Anne Geddes - Toadstool - Dorm Room Poster features the always adorable artwork of Anne Geddes. This dorm necessities item features a baby with yellow butterfly wings on top of a bright red toadstool. Surrounding the base of the toadstool in this college supplies item is green grass and flowers with a matching green backdrop. Across the green backdrop in this dorm room decor item are yellow and white dots that highlight and match the flowers and spots in the toadstool. This cheap dorm supplies item will look great near your dorm room window so you can have a little bit of the outside inside of your dorm room!